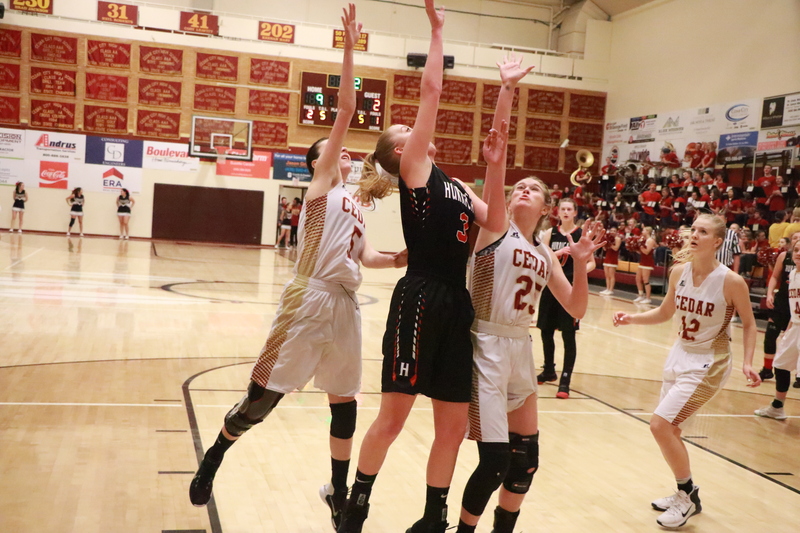 CEDAR CITY — Despite being behind most of the game, the Hurricane High girls basketball team defeated Cedar Thursday night, 43-41. Senior guard Jayden Langford of Hurricane made a driving layup with less than one second remaining to give the Lady Tigers the victory. The game-ending sequence marked the third straight time Hurricane had run essentially the same play during the final two minutes of the game. Cedar’s Brooke Shoop made a pair of free throws with 1:53 left to give the Lady Reds a 39-37 lead, but seconds later Langford tied the game on an inside drive from the right side of the basket, making it 39-39. On Cedar’s next possession, sophomore guard Japrix Weaver missed a 3-pointer, but a teammate got the rebound and fed the ball back to Weaver for an inside bucket, putting Cedar ahead 41-39 with one minute remaining. Once again, Langford answered with a drive inside, tying the score 41-41 with 45 seconds to play. On the ensuing possession, Cedar ran more than 15 seconds off the clock as it geared up for what was expected to be a last-second shot attempt to win. However, a Cedar player was whistled for traveling, giving the ball back to Hurricane with 27 seconds remaining. Hurricane head coach Franci Homer said the turnover was a lucky break for the Lady Tigers. “We were just hoping to get a stop and then call timeout,” she said. During the team’s final timeout, Homer called for Langford to do the same thing once again. “Coach said if I get the ball, to just attack,” Langford said. “We passed it around a couple of times, and the time actually ran out a lot faster than I thought it would. It was the second narrow defeat in three days for Cedar, which lost to Pine View 53-49 in overtime on Tuesday. Cedar started off strong against Hurricane, opening up an early 7-0 lead. Senior Carley Davis made Cedar’s first five points, including swishing a 3-pointer on the first possession of the game. At the end of the first quarter, Cedar led 13-6. With just under three minutes left in the second period, Japrix Weaver made an inside shot to extend the Lady Reds’ lead to 10 points, 21-11. However, Hurricane closed out the second quarter on a 7-0 run, with Langford drilling a 3-pointer, followed shortly thereafter by a running 8-footer by Kailee Yardley and a pair of free throws by Halli Gubler. Early in the third period, Hurricane kept the momentum going, taking a 22-21 lead on an inside shot by senior forward Alexa Christensen with 7:00 left. Over the next few minutes, the score stayed close, with neither team leading by more than one point and the lead changing hands several times. Cedar closed out the third quarter on a strong note, outscoring Hurricane 8-0 over the final 2 1/2 minutes. Davis drilled another 3 with 1:00 left to put Cedar up 31-27, after which Hurricane turned the ball over. Japrix Weaver drove inside and scored a basket with four seconds left to give Cedar a 33-27 lead, after which her teammate Logann Laws immediately stole the inbounds pass and made another shot as time expired to give the Lady Reds an eight-point cushion heading into the final quarter. In the first half of the fourth quarter, Hurricane once again rallied to get back in the game. With 3:23 left, senior Dream Weaver of Cedar picked up her fifth and final personal foul while going after a loose ball at midcourt. Langford made the first free throw of her one-and-one situation, but missed the second. However, Christensen grabbed the rebound and put it in, narrowing the Tigers’ deficit to two points, 37-35. Shortly thereafter, Hurricane guard Kylee Stevens made a pair of clutch free throws to even the score at 37-37 with 2:42 left. 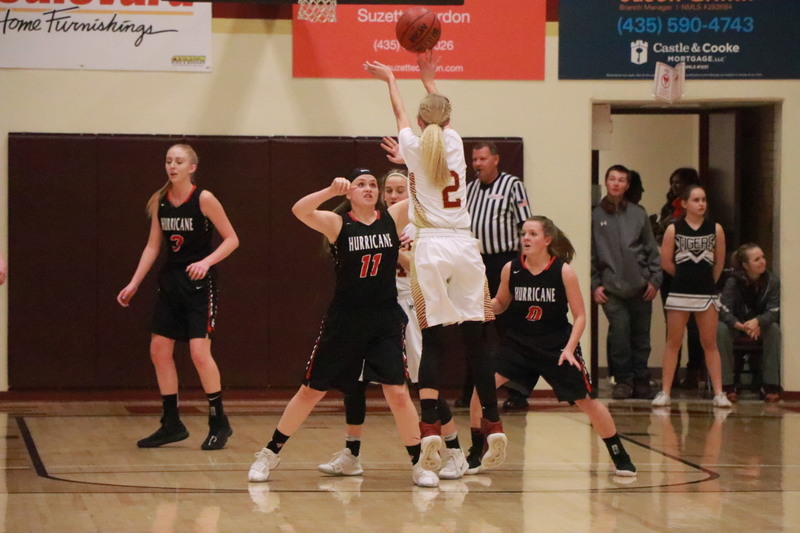 Langford led all scorers with 18 points, while Christensen added 10 for the Lady Tigers, who improved to 2-3 in Region 9 play with their second straight victory. Cedar, which was led by Japrix Weaver’s 16 points, dropped to 3-2 in region play. Davis added eight points for Cedar and Laws contributed five. Hurricane’s next game is at home vs. Snow Canyon on Tuesday, Jan. 23, while Cedar plays at Dixie that same evening. Desert Hills outscored Region 9 rival Dixie 9-2 in the final quarter to pull out a 33-31 victory Thursday evening. Dixie led at the end of each of the first three quarters, but missed several free throws down the stretch as Desert Hills edged ahead at the end. “It was a disappointing loss, but I was really proud of how we bounced back after the loss to Snow Canyon,” said Dixie head coach Ryan Forsey. “Desert Hills played a heck of a game, and our guards couldn’t handle their defensive pressure in the fourth quarter. It makes it really hard to finish off a team when you can’t take care of the ball and execute. “It’s a growing process that’s tough, but hopefully it will strengthen us in the long run,” Forsey added. Both teams now have 2-3 region records after Thursday night’s contest. 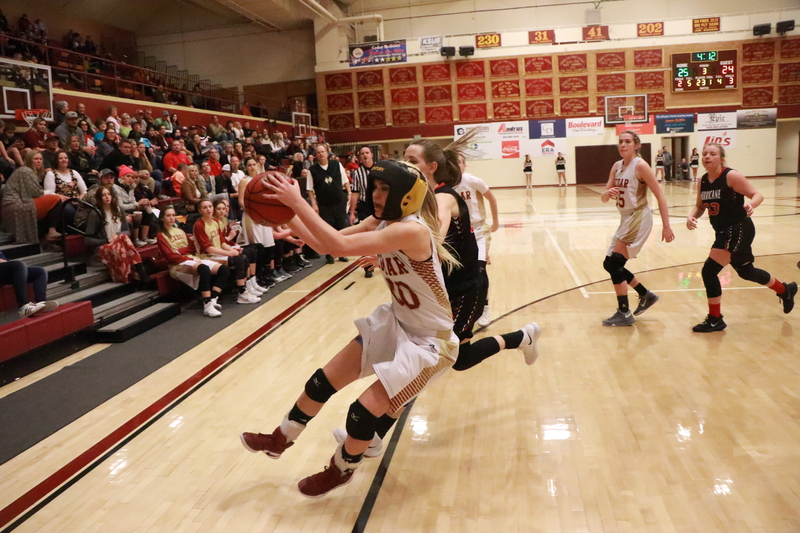 Sophomore guard Sina Schwalger, one of Dixie’s top scorers, was injured with a possible concussion during the fourth quarter after colliding with a Desert Hills player. She left the game with four points. Dixie was led by Joslyn Bundy’s 10 points, while Sina Tapasa added six. Desert Hills was led by Madi Clark’s 10 points, with Kami Bliss adding eight. Desert Hills’ next game is at Canyon View on Tuesday, Jan. 23. Dixie will host Cedar High in other Region 9 action that same evening.